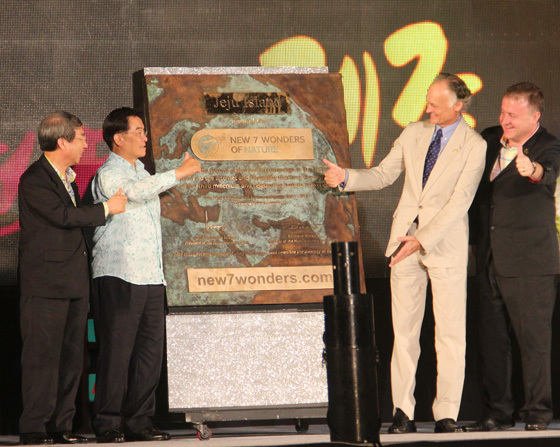 The unveiling of the specially-cast bronze plaque marking the Official Inauguration of Jeju Island as one of the New7Wonders of Nature was attended by Professor Chung Un-chan, former Prime Minister of South Korea, and Jeju Governor Woo Keun-min (left), as well as Bernard Weber, Founder-President of New7Wonders, and Jean-Paul de la Fuente, Director of New7Wonders (right). In front of a crowd of 20,000 people on Iho Beach adjoining Jeju City, the Official Inauguration of Jeju Island as one of the New7Wonders of Nature took place today. Among those taking part in the ceremony were Professor Chung Un-chan, former Prime Minister of South Korea, Jeju Governor Woo Keun-min, Bernard Weber, Founder-President of New7Wonders, and Jean-Paul de la Fuente, Director of New7Wonders. 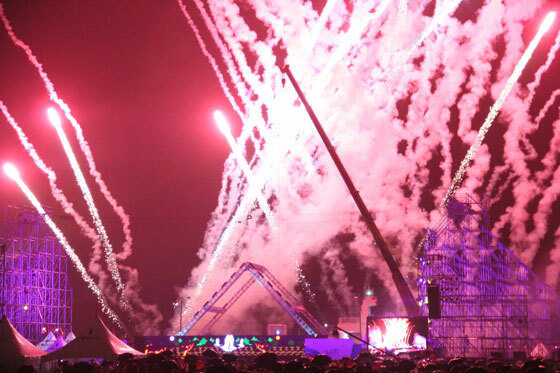 The celebrations culminated in the largest-ever fire, flame and light spectacle ever seen on Jeju Island.